Changing tastes – what’s new is old. These three recipes are from a Swedish immigrant cookbook: Fullständigaste Svensk-Amerikansk kokbok (Popular Swedish-American cookbook) which I wrote about here. Immigration and ethnic communities is a significant area in which culinary history sheds light on a larger theme in American history. Immigrant women had a reason for needing cookbooks. They had come to a place where kitchen tools and measurements were different than those they had learned as children. Ingredients they had known in the Old Country often needed substitution in America. They were pulled in two directions – maintaining familiar foodways, and adapting to their new environment. 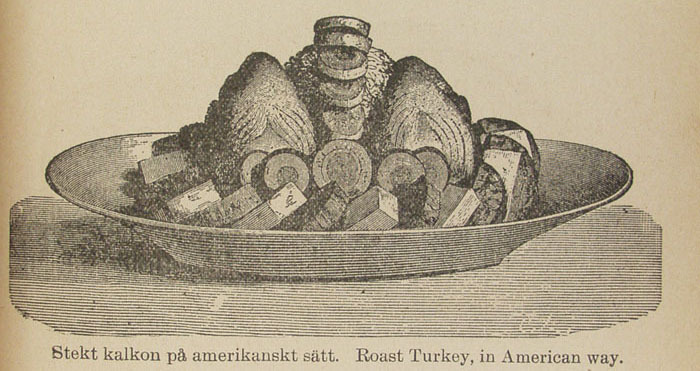 Through publications by and for immigrants, we can trace the process of becoming American, accommodating American foodstuffs and foodways and creating a cultural identity that was both, for instance, Swedish and American. Turkey stuffed in French manner. Remove from turkey weighing from seven to eight pounds all the inside matter; then dry it with a clean towel, but use no hot water. Take five pounds of meat from a young steer calf, scrape away all cords and chop it. Mix the minced meat with half a pound of kidney lard, half a pound of ox marrow and a portion of stuffing. Work this for a while until it becomes fine and smooth; then add three eggs, salt and pepper to suit, also a wine glass of French brandy. Mix well again and fill with it that part of the turkey where it had the crop, but on the uppermost part below the skin, put in slices of dressing. The stomach is tilled in the same manner. Next sew the turkey together and line it with large slices of pork. The turkey ought to lie filled in this way three or four days in order to get the taste of the stuffing in the meat. Roast it but slightly and put it whole on the table. Remember that the stuffing swells. Hence do not fill too much. 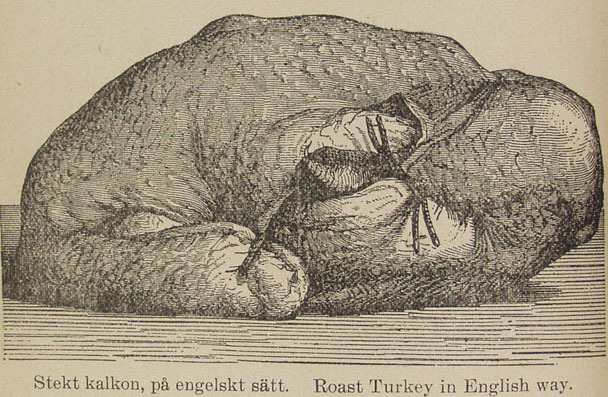 Roast turkey in English way. Kill several days before cooking, and let it hang by the legs until used. Prepare in theusual manner; stuff with bread crumbs—rejecting the crust—rubbed fine, moistened with butter and two eggs, and seasoned with salt, pepper, parsley, sage and sweet marjoram; sew up, truss and place to roast in a rack within the dripping-pan; spread with bits of butter, tum it and baste it frequently with butter, pepper, salt and water; a few minutes before it is done glaze over with the white of an egg; take up the turkey, pour off most of the fat, add the chopped giblets and the water in which they were boiled, which thicken with flour and butter rubbed together: stir all in the dripping pan, let it boil well, and serve in a gravy dish. Serve with celery-sauce and stewed gooseberries or cranberries. Garnish with fried oysters. Select a turkey of eight to ten pounds. If in roasting it is likely to brown too much, cover with a white paper, buttered. Roast turkey in American way. Dress and rub the turkey well, inside and out, with salt and pepper; truss or twine it; put in a steamer and steam two hours, or until it begins to grow tender, lifting the cover occasionally and sprinkling lightly with salt; then take out, loosen the legs, and rub the inside again with salt and pepper. Make the stuffing as follows: Take a loaf of stale bread, take off the crust and soften it in a pan of boiling water; drain off immediately and cover closely; crumble the soft part of the bread very fine, and add half pound melted butter, or more if to be very rich, and a teaspoon each of salt and pepper. Drain off the liquor from a quart of nice oysters, bring to a boil, skim and pour over the bread crumbs, adding the soaked crust and one or two eggs; mix thoroughly with thehands, and if too dry, moisten with a little’ milk; lastly, add the oysters, being careful not to break them; or first put in a spoonful of stuffing and then three or four oysters, and so on until the turkey is filled, stuffing the breast first. Flour a small cloth and place over the openings, tying down with twine; spread the turkey all over with butter, salt and pepper; place in a dripping-pan in a well heated oven; add a half pint water, and roast two hours, basting of ten with a little water, butter, salt and pepper, kept warm in a tin placed on the back of the stove. A swab is better than a spoon to baste with. Turn until nicely browned on all sides, and about half an hour before it is done, baste with. butter alone and dredge with a little flour, which will give the turkey a frothy appearance. When the turkey is dished, if there is much fat in the pan, pour off most of it and add the giblets, together with the water in which they have previously been cooked until tender, now stewed down to about a pint; place one or two tablespoons flour (half of it browned flour) in a pint bowl, mix smooth in a little cream or milk, and add to the gravy in the pan; boil several minutes, constantly stirring and pour into a gravy tureen. Serve with currant or apple jelly. However you celebrate, Happy Thanksgiving to you and yours. I talked to a Women’s Studies class last week, about how gender and class are constructed in 19th century cookbooks and domestic manuals. The aim of the class was to make the students (all freshmen) familiar with working with primary source materials. What follows is an edited version of my talk. We’re looking at cookbooks and housekeeping manuals, written mostly by and for middle-class women. On the surface of it, these practical books for how to do practical things. The question is, what can we find in these books to tell us about the world in which they were created? What traces of their social context do they bear? First, why were such books published? Better yet, what need was the author trying to fill? Often, in the beginning of such books, the author will ask and answer that question, sometimes after apologizing for publishing another such book when there are already so many on the market. One strategy is for the author to say that none of the published books will fill a specific need as well as this one. For instance, economical meals within the capacity of the inexperienced cook, or sound advice for the young wife just going into housekeeping. Other books, the author then asserts, assume too much knowledge on the part of the reader, are impractical, or aren’t built on the same wealth of experience. Another strategy is for the author to say that she has long been consulted by her daughters, neighbors, readers, etc, and in answer to their express wishes has made this trove of information and practice available to the public. A complimentary strategy is for the author to say that she remembers the perplexities she faced when she begin to keep house, and wants to save the reader those torturous hours of confusion and frustration. The general theme is that there is a body of technique that the reader now needs to master, having been taught it neither at home nor at school, and this book with its wise counsels is the best source for it. Cookbook and domestic manual authors didn’t confine themselves to telling readers how to cook particular dishes and perform specific household chores. Some of them had a project to extoll or promote specific values, often having to do with traditional female virtues like devotion to family, gentle manners, and selflessness. This gives us information about both the author and her world. You can read a lot from the energy an author puts into her descriptions. The more strident the author is, the more she goes into flights of eloquence about, say, women’s duties and burdens, the more reason we have to think that she’s promoting her pet values because she thinks they need bolstering, which tells us that she didn’t see them being played out in American society, at least not to her satisfaction. Catherine Beecher is an excellent example of this. Her writings lay great stress on the values Americans should use to guide their actions and decisions. She identifies these values as fundamental to American civilization, which is to say she asserts that they’re already in play, but she also promotes them vigorously, recommending them to the reader as the cure for numerous societal problems. Some values apply to all Americans, but her real focus is on American women. Beecher had a large project about gender and social relations. She tried to reconcile the inequality of women with an egalitarian democracy by emphasizing the importance of woman’s sphere of domesticity. The way she saw it, the world was divided into equally important male and female spheres. They were definitely equal, and definitely separate. Women weren’t to be subordinate because they were inferior to men, but because the subordination of some people to others (children to parents, servants to masters, women to men) helped society function more smoothly. Therefore it was women’s duty to the good of the nation to accept their subordinate place. At the same time, they were to understand that their contribution to the American nation was essential and of the highest value, and so to take pride in successfully carrying out their household and family duties. Women’s contribution was shaping “the intellectual and moral character of the mass of people” by the influence of home life on their husbands and children. Also, women counteracted commercial and acquisitive values by creating a home where duty and benevolence ruled. The good American home was a stable base in a chaotic, rapidly changing society. Beecher’s aim was to “standardize and systematize American domestic practices” as a basis for national unity. The example of order and system was always to be before family members so they’d carry it into public life. Beecher’s writing is more clearly polemical than that of other writers on women’s work, but similar sentiments can be found in many cookbooks and domestic manuals. Let’s look at some of the ways gender and class are constructed in these genres. You could, by the way, gain similar insights from advertising ephemera, books on etiquette, books on women’s employment, and books addressed to servants. A subject search on “Women — Social and moral questions” will also turn up a number of interesting sources. These insights come from reading the materials closely, paying attention to what the authors assume about women and their sphere, and the way they describe women’s day-to-day concerns: their activities, challenges, problems, and aims. Forewords, prefaces, and introductory chapters are a particularly fertile source for this, but these kinds of descriptions are often scattered throughout the books, alongside recipes and housekeeping instructions, or in chapters on management of servants, entertaining, or the service of meals. One very important way gender is constructed in these materials is in terms of what women were simultaneously assumed and enjoined to care about. Beecher constructs gender in terms of women’s responsibilities to their families and communities, to the US as a pioneering democracy, and therefore to the progress of civilization, and therefore to the whole world. Other writers don’t go quite as far, at least not explicitly, but the idea is often hovering in the background that women, in fulfilling their domestic duties, are making the world a better place. This quote from The Young Housekeeper’s Friend (1859) sets the stage for the importance of women’s responsibilities, by drawing out the consequences of their behavior. I’ll talk more about this way of constructing gender in a minute, but first let’s look a little more closely at some of what women were responsible for. In the works we’re considering, food has a number of jobs to do. Writers stressed its importance as a source of comfort or pleasure, a cause of good or bad health, and even essential to a person’s effectiveness in the world. In feeding their families, then, women were charged with a higher mission. It was women’s task to see that food, in the family’s life, did its various jobs. Moreover, cookbooks and housekeeping manuals are full of talk about the need for order and system. Sometimes this is just advice for how to get through the work of housekeeping and cooking, which was a lot of work in the 19th century. But often it has a social or even moral dimension. Orderly domestic doings become, in some authors’ commentary, a reflection on the character of the mistress of the household, and they are crucial to her mission, as a woman, to make her home a place that promotes the health, comfort, serenity, and good spirits of the family members, and even their moral character. In some authors’ hands, disorderly housekeeping, including the hurried or ill-tempered serving of meals, becomes a sign of a sloppy soul, and the lack of comfort and cheer it entails puts the family members in danger of falling into dissolute habits, for instance in seeking fulfillment, comfort, or amusement outside the home. By the same token, gender is constructed around women as the creators of home comfort in cleanliness and order, and in overall attractiveness as an environment. The family fireside was a locus of virtue in the 19th century, where values like charity, civility, and piety were reinforced. Women were to secure the place of the home as the center of family members’ lives by making it a desirable place to be. This would make family members both virtuous and happy. Gender was constructed around women as the creators of home comfort in cheerfulness, patience, attention and other ways of creating a pleasant social atmosphere. Beecher, in her Treatise on Domestic Economy (1842) stresses women’s duty to be agreeable and conciliating to those around her, and, implicitly, her duty not to show her emotions or express her thoughts in a way that might be uncomfortable for others. Women’s responsibility included rearing their children to be good citizens of the republic, and to be virtuous people. They were to accomplish this by explicit instruction, by correction of faults, and by modeling virtuous behavior as well as by creating a home environment that reinforced good habits. This quote from the Boston School Kitchen Text-Book (1887) pinpoints the family dinner as one location for learning to be helpful, considerate, and socially adept. It’s not all so obvious as the examples I’ve given you, sometimes you have to read more between the lines. For example, as we’ve seen, if you were a housewife, you had to worry about feeding your family neatly, efficiently, healthfully, and in a comfort-inducing manner. One thing many authors particularly emphasize is the need for good bread. Bread was a major element of the American diet in the 19th century, far more than it is today, and in most cases it was made at home. If you were going to worry about good bread, you had to worry, first of all, about good flour and good yeast. With flour, which was generally bought by the barrel, you had to worry about knowing good and bad flour when you saw it, and getting it from a reliable source, so you were sure it was of good quality. Then you had to worry about storing it where it would stay dry and cool, and wouldn’t be contaminated, which brought the construction of your kitchen or store-room into consideration. Then there was yeast, which you probably made yourself, and which had to be not only prepared properly, but also stored in the right kind of container, so as to be kept alive and ready for baking day. Yeast was first commercially produced in the United States in the 1860s, but we see recipes for home-made yeast in cookbooks right through the end of the 19th century. You also had to see that the bread was well-kneaded (some authors held this couldn’t be trusted to servants, that you had to stand over them to see it was done properly, or do it yourself.) Then you had to see to it that it was allowed to rise at the proper temperature and for the right amount of time, and baked long enough, but not too long, in an oven that was neither too hot nor too cold, which, with wood or coal-burning stoves, was an art in itself. Cookbooks and domestic manuals are full of this kind of detail, the moral burden of which isn’t made explicit, but the charge of women’s roles and responsibilities was always there in the background. These books construct class in a number of ways, including numerous aspects of eating, especially dining in company, at dinner parties and on other formal occasions. Class is also constructed through manners more generally, through taste and adherence to fashion, and especially through relations with servants. Most of what we find in these books is about what marks the boundaries for the middle class, sometimes set off against the class identity of servants. Class was constructed through food and especially through the rules of the table: what, when, where, how, and with whom you ate all marked your class status. Another way of constructing class through food was in different diets for those who did or did not do physical labor. There was an emphasis on lighter eating/preserving digestion for members of the middle class, for instance for men worked in an in office, and for women who did no physical labor at home. In other words, those who performed intellectual work needed more delicate food, those who did physical labor were to eat coarser food. Then there was formal dining, especially in entertaining. What kind of table you set defined your social rank, and the rules for service showed you were in the club of “good society.” This quote from The Century Cook Book (1895) advises on how high to aim, and cautions the reader on not overreaching, so the dinner will be a success and you won’t lose points in the game of social status. Class was constructed around manners. In the 19th century, rules for etiquette, which is to say rules for the display of manners, or “good breeding”, created an in group and an out group, and within the group you could have a high or a low place, so you had to worry about your score. It’s not just what made you a social success or a social failure –in some circles, then as now, friendliness or charm could make you a success. Rather etiquette was about what made you acceptable in what defined itself as “good society”. This was a club you had to make a special effort to get into, or, if you were born into it, to stay in. Because there was a penalty for not succeeding, exclusion and reputation damage, a lot was riding on manners and correct behavior, and they were a source of anxiety for the middle class and anyone aspiring to it. In a very large and prosperous households the mistress might be in charge of male servants, footmen or a butler, in very grand establishments perhaps even a male chef, but most middle-class women has charge only of female servants. The discussions of the housewife’s relationship to these maids, nannies, waitresses and cooks are full of advice about how to speak to them, what to expect of them, how to arrange their days and oversee their work, what she needed to teach them, and more. In The Century Cook Book There’s a section called “to train a green cook” which shows middle-class anxiety about trusting servants (in this case whoever will be in charge of feeding the family) to know what they’re doing. In instructions for housekeeping, authors construct class by what they assume the reader has in the way of rooms, furnishings, and equipment . When they give instructions that specify how to care for: servants’ quarters, multiple bedrooms, nursery, dining room, parlor, kitchen, store-rooms, etc, they mark out the territory occupied by middle-class households. The same happens when they talk of feather beds to be aired, carpets to be beaten, and ornaments to be dusted. And the same goes for tools for housekeeping and cooking. In this quote from Beecher’s Domestic Receipt-Book in a chapter called “On a proper supply of utensils and conveniences for housekeeping” she makes it clear who she’s talking to. So, we’ve seen how, in their descriptions of women’s work and their concerns, domestic manual and cookbook writers presented specific pictures of gender and class to the middle-class women who were their presumed audience. The authors simultaneously took for granted and promoted values such as devotion to family, and the display of refinement in the home. In what they assumed they’ve left us a portrait of normative ideas about class and gender, ideas about which there was wide agreement. In the values they take special trouble to promote, we see the cracks in the system, the values that were contested, and that the authors felt were endangered. The Cooking School movement started in England in the last third of the 19th century. It was of a piece with other reforms intended to better the lives of the urban poor. Workers in rapidly -industrializing England suffered considerable dislocation as they moved to cities, where the available housing had different, and often much sketchier, cooking apparatus than the dwellings of rural laborers. The foodstuffs available in cities were also far different from those in rural settings, so cooking and eating habits invariably shifted. The movement’s original focus was to teach the urban laboring poor to eat well within their means. A national training school opened in 1873, continuing the work by training cooking teachers. Buckmaster’s cookery : being an abridgment of some of the lectures delivered in the cookery school at the International Exhibition for 1873 and 1874 : together with a collection of approved recipes and menus is an artifact of this phase of the movement. 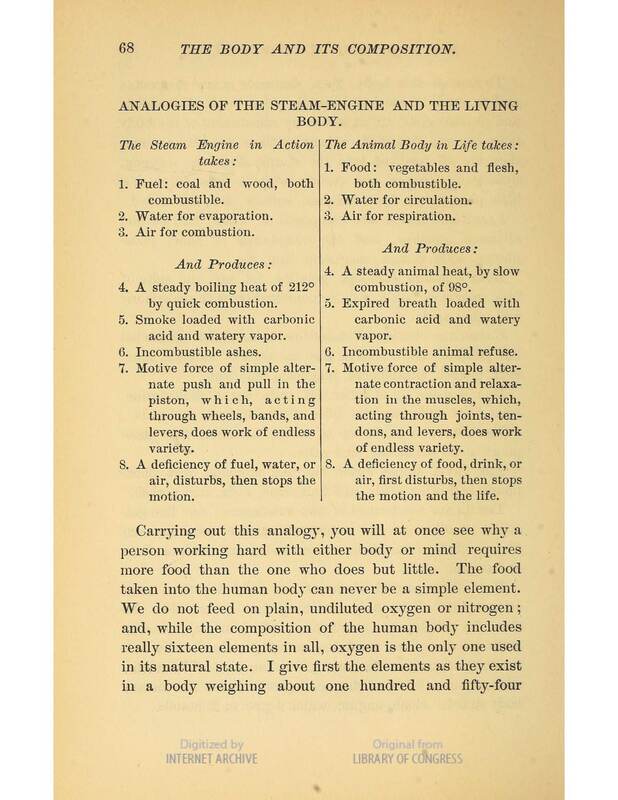 The lectures address topics that were to be reiterated at length in other Cooking School publications: soup as a healthy, economical, and underappreciated aliment; how to manage leftovers; food as fuel for the human machine, and the need for girls to be educated in kitchen and household arts. In America, reformers and cookbook writers soon took up the cause, but as the movement took hold in America, the focus began to shift. American reformers were much concerned with the issue of unemployment, and began to hold classes designed to teach unemployed women the skills that would allow them to find work as household servants. Such classes did not, it turned out, pay the rent, and it wasn’t long before the schools began to feature classes aimed at a middle class audience, which thereafter existed side by side with classes for women already employed as domestics. Late 19th century cookbooks and domestic manuals are full of talk about the problems with the American diet: American cooking was denigrated as indigestible, unhealthy, and wasteful. The word “dyspepsia” was on everyone’s lips. Experts of all kinds put forward schemes for the reform of the national diet; the reformers of the Cooking School movement touted a more scientific approach in the practice of cooking to address this national ill. In this we see the promotion of the professionalization and rationalization of cooking, as of many elements of American life in the last third of the 19th century. There was also a push for cooking to be taught in public schools, and the Domestic Science movement (later the Home Economics movement) had similar aims for housekeeping and the management of the home. Cooking schools began publishing cookbooks within a few years of their formation, and this new kind of cookbook was an established phenomenon by the mid-1880s. We have excellent examples of this genre of culinary publishing, and the related one of textbooks for cooking classes in the public schools, which became popular a little later. Mrs. D.A. Lincoln (Mary Johnson Bailey Lincoln) was the principal of the Boston Cooking School from 1879 to 1885, and was active as a teacher and an author thereafter. We have her 1887 Boston school kitchen text-book : lessons in cooking for the use of classes in public and industrial schools . It, too, takes up the theme of a scientific understanding of food, cooking, and nutrition. Lessons include rudimentary physics in explanations of the cooking processes, something approaching chemistry in the composition of foodstuffs, and detailed commentary on nutrition and digestion. The volume gives us a valuable window into the pedagogical process, as practiced in the classes: each lesson has its set of recipes to be cooked, and is proceeded by suggestions to the teacher, allowing us to see the details of the process of teaching. Lessons are also followed by sets of questions, making explicit what the students were intended to take away from them. An altogether more curious volume is the 1890 Cookery in the public schools by Sallie Joy White, (Brief biography here) which gives us a window into the movement as it got underway. It’s pitched to girls who were potential students of cooking classes, and the author adopts a chatty, anecdotal style, addressing the readers at one point as “…my dear little amateur cooks who read this.” Besides providing a first-hand look at how adults addressed children at the end of the 19th century, and what topics and strategies one author thought fitting to engage children’s interest, it also gives us a window into the rhetoric used to support the establishment of cooking classes in public schools, the perceived need for manual training and cooking instruction, and the contemporary perceptions and preoccupations that made them seem desirable. We also hold a dozen more works on cooking in the public schools from the early 20th century. Through our works on cooking schools and cooking in schools, the researcher can explore a fascinating chapter in the history of cooking as a daily necessity, an element of home life, a public good, a debated educational priority, and a site of the performance of class and gender in the late 19th and early 20th centuries. This month marks the sesquicentennial of the beginning of the Civil War, and our current exhibit is on the first year of the war. What follows is the substance of a presentation I gave at an Afternoon With The Curators last week. I will send you a few tomatoes different from any I have seen in Michigan. The vines when stretched are taller than 2 [ The tomatoes small smooth and long and sweeter than the common kind. They were issued rations, typically very basic: cornmeal or flour , sugar, coffee, molasses, salt pork, fresh or salt beef, hard tack or crackers, sometimes with the addition of beans, fresh or desiccated vegetables (which the soldiers hated, and called “desecrated vegetables”) and rice or hominy. It seems they sometimes had the option of buying extra food from the quartermaster, although this was a privilege usually reserved for officers, who, instead of drawing rations were issued a monthly cash allowance with which to buy their supplies. Sutlers weren’t the only ones who sold food to the soldiers, of course. Soldiers also bought food from what some of the writers refer to as Hucksters: locals who came to camp to sell food or sold by the side of the road: these seem to have been mostly ready-to-consume foods, cakes, pies, fruit, cider, and candy are all mentioned in our Civil War letters. Soldiers also bought eatables from locals who sold food out of their houses or off their farms. “We had not been there long when some of the boys went out for what we call cramping and soon returned with a 12 or more of hogs and pigs which they had shot. Food has always borne an especial importance for soldiers, who have extra trouble procuring it but who need it more than ever–for morale as well as their extra nutritional requirements. Ingenuity is valued, and gratitude heartfelt. From the evidence of our Civil War letters, meals were a significant source of comfort and interest in soldiers’ day to day lives. The letters provide documentation of the variety of official and unofficial ways the soldiers were fed, and of their attitudes towards and feelings about all things gustatory. For exploring these matters, the above examples show how our Food and Society Database is an invaluable tool for saving the researcher’s time. One of the stories we tell ourselves is that, if you look in a cookbook from a previous era, you will find vegetables cooked much longer than we would no countenance. There’s the lamentable tendency to shake our heads and tut about the fate of the poor veggies. TO BOIL SPINACH (English Mode). 1155- Ingedients.—2 pailfuls of spinach, 2 heaped tablespoonfuls of salt, 1 oz. of butter, pepper to taste. Mode.—Pick the spinach carefully, and see that no stalks or weeds are left amongst it; wash it in several waters, and, to prevent it being gritty, act in the following manner:— have ready two large pans or tubs filled with water; put the spinach into one of these, and thoroughly wash it; then, with the hands, take out the spinach, and put it into the other tub of water (by this means all the grit will be left at the bottom of the tub); wash it again, and, should it not be perfectly free from dirt, repeat the process. Put it into a very large saucepan, with about 1/2 pint of water, just sufficient to keep tho spinach from burning, and the above proportion of salt. Press it down frequently with a wooden spoon, that it may be done equally; and when it has boiled for rather more than 10 minutes, or until it is perfectly tender, drain it in a colander, squeeze it quite dry, and chop it finely. Put the spinach into a clean stewpan, with the butter and a seasoning of pepper; stir the whole over the fire until quite hot; then put it on a hot dish, and garnish with sippets of toasted bread. Time.—10 to 15 minutes to boil the spinach, 5 minutes to warm with the butter. Average cost for the above quantity, 8d. Seasonable.—Spring spinach from March to July; winter spinach from November to March. Moreover, Marion Harland’s 1882 Common sense in the household: a manual of practical housewifery (online here) recommends an even longer time, 15 to 20 minutes, and in her in her 1884 Cookery for beginners: a series of familiar lessons for young housekeepers she calls for it to be cooked for 45 minutes. But it turns out that it depends on which cookbook, and how old. WASH your spinage well in several waters, put it in a cullendar, have ready a large pan of boiling water, with a handful of salt, put it in, let it boil two minutes, it will take off the strong earthy taste, then put it into a sieve, squeeze it well, put a quarter of a pound of butter into a tossing pan, put in your spinage, keep turning and chopping it with a knife until it be quite dry and green, lay it upon a plate, press it with another, cut it in the shape of sippets or diamonds, pour round it very rich melted butter, it will eat exceeding mild, and quite a different taste from the common way. Looking further back, in an edition of Hannah Glasse’s Art of cookery, from 1796, we find the following directions for spinach, very much as we would cook it now. PICK it very clean, and wash it in five or six waters; put it in a sauce-pan that will just hold it, throw a little salt over it, and cover the pan close. Don’t put any water in, but shake the pan often. You must put your sauce-pan on a clear quick; fire. As soon as you find the greens are shrunk and fallen to the bottom, and that the liquor which comes out of them boils up, they are enough. Throw them into a clean sieve, to drain, and just give them a little squeeze. Lay them in a plate, and never put any butter on it but put it in a cup. This is not to say that no one in the the late 18th century cooked the stuffing out of spinach, but it does point out the unwisdom of thinking we know what we’ll find when we peer at the past through the window of cookbooks. A young housekeeper of my acquaintance, ordering a spring dinner for herself and husband, purchased a quart of spinach. When it should have appeared upon the table, there came in its stead a platter of sliced egg, she having given out one for the dressing. “Where is the spinach?” she demanded of the maid of all work. “Under the egg, ma’am!” And it was really all there. Moral.—Get enough spinach to be visible to the naked eye. A peck is not too much for a family of four or five. If Americans have any one person to thank for the Thanksgiving holiday, it is Sarah Josepha Buell Hale. Hale waged a decades-long campaign for the establishment of a national Thanksgiving Day on the last Thursday of November. She was born Sarah Josepha Buell on October 24th, 1788 in Newport, New Hampshire. She was educated at home, with tutoring in Latin, philosophy, English, and classical literature by her brother while he was a student at Dartmouth. As a young woman she distinguished herself as a teacher at a private school in Newport. She was married in 1813 to David Hale, a lawyer, with whom she continued to study such topics as French, botany, geology, and literature. She remained a strong proponent of education for women throughout her life. When she was widowed in 1822, she turned to literature as a means to support herself and her children. She established her reputation in 1827 with the novel Northwood, in which we already see a Thanksgiving theme emerging: a Thanksgiving holiday forms the background for part of the action, and the Thanksgiving meal has a chapter of its own, with roast turkey and pumpkin pie being given pride of place on the groaning board. From 1837 to 1877 Hale was the editor of Godey’s Lady’s Book, a wildly successful magazine for women which achieved a circulation of 150,000 by 1865. Hale used her monthly editorial to advocate for the causes to which she was committed. While she was especially enthusiastic about education for women, she also agitated for women’s employment, a monument on Bunker Hill, making Mount Vernon a national shrine, the elevation of housekeeping to a profession, and of course Thanksgiving. The custom gathered force, due in part to Hale’s promotion of it, with many states and territories declaring a holiday on the appointed day. Hale’s efforts finally met with success in 1863, when Lincoln, in a proclamation of October 3rd, proclaimed the last Thursday of November as a national holiday. Subsequent presidents followed suit, and in 1941, a Congressional Joint Resolution officially set the fourth Thursday of November as a national holiday for Thanksgiving. Hale contributed largely to periodicals besides her own and published more than forty volumes of poetry, fiction, plays, biography, household management, and cookery. The Clements has a number of her works, including the 1873 revised edition of her Mrs. Hale’s new cook book : a complete cookery book for all classes with rules and illustrations for household management and full directions for carving, arranging the table for parties, etc. : together with preparations of food for invalids and for children. A very large turkey will require three hours’ roasting; one of eight or ten pounds, two hours ; and a small one, an hour and a half. Roasted chestnuts, grated or sliced, and green truffles, sliced, are excellent additions to the stuffing for turkeys. The book is also a platform for a certain amount of editorializing. “Cookery, as an Art, ranks in the highest department of useful knowledge, connected, as it is, with the welfare of every human being. This is a familiar theme for the proponents of Domestic Science, a term Hale coined: women were to make the world a better place by creating an environment that would foster virtue, whereupon virtuous action would diffuse from the home into society. Hale, like many of the writers and teachers who espoused this idea, was not herself averse to acting on a wider stage, with her editorials, letter writing, and other campaigns for the causes she undertook. If she had been, our Thanksgiving holiday might look very different. There’s a good deal of history to be divined from these works, especially when you consider them set against the spiraling production and consumption of sugar in the 18th & 19th centuries. As sugar grew more available, cooks and confectioners developed a plethora of ways to use it. In the Glasse book, there are numerous chapters that ring the changes just on what you can do with sugar and fruit: compotes, conserves, jam, jellies, marmalades, clear cakes, dried fruit with sugar, etc, not to mention all the other confections. But occasionally these works find another use. Ann Arbor is fortunate enough to be the home of a candy maker with a deep interest in handmade candy, and he’s been in on and off over the last several weeks, studying some of our candy manuals from the mid-19th century. Now, there’s an opportunity to hear him speak on his engagement with sugar and what can be made with it. Charlie Frank is the principal in Zingerman’s Candy Manufactory, makers of Zzang bars. You can read enthusiastic reviews of his candy here and here. What he strives for, at the cost of no little trouble, is the pleasures that come with absolutely fresh candy, made by hand with care, and shipped in small batches. This week, Charlie is giving a talk on his candy making, and the devotion that lies behind it. Below is the official announcement. Charlie Frank, Candymaker and head of Zingerman’s Candy Manufactory, will talk about his path to a life making candy, his enthusiasm for his work, how candy is made at Zingerman’s, and how everybody can relate to his passion for…SUGAR! Candy tasting and a Q&A will follow. I’m giving a short talk tomorrow about a very special charity cookbook. The Suffrage Cook Book, compiled by L.O. Kleber. If you want to make its acquaintance you can find it online as full text at Gutenberg here, and as page images here (requires the DJVU plugin.) It was published for a Suffrage group, the Equal Franchise Federation of Western Pennsylvania, in 1915. We have more than 1000 charity cookbooks, 700 and some of them cataloged. You can find them in Mirlyn, the University of Michigan Libraries’ catalog, by going to advanced search, and putting “charity cookbooks” in the “Subjects” field. The first charity cookbook was Maria J. Moss’ A Poetical Cook Book, written for the 1864 Sanitary Fair in Philadelphia, an exposition held by the Philadelphia branch of the United States Sanitary Commission, a relief organization whose funds went to support those wounded, widowed, or orphaned by the Civil War. You can read more about The Great Philadelphia Sanitary Fair here, read Lincoln’s address at a similar fair in Baltimore here, or see a splendid image of the fair building here. Charity cookbooks in the late 19th and early 20th centuries embraced many causes, everything from support for the local church building fund to national-scale movements like Temperance. Suffrage is a strikingly apt cause for a charity cookbook, as a move by women to act in the public sphere. I call it apt because the act of creating a charity cookbook was a crossover activity: women who created these books were, on the one hand, staying within women’s sanctioned sphere – what could be more securely within women’s domestic concerns than cooking? However, they were also publishing a book, and fundraising for an unabashedly political cause, and thereby participating in a national debate, so they were taking action on the national stage. Much more on this and related topics can be found in our exhibit on “The Old Girl Network”. Woman Suffrage has gone beyond the trial stage in Idaho. We have had it in operation for many years and it is now thoroughly and satisfactorily established. Its repeal would not carry a single county in the State. The women form an intelligent, patriotic and energetic element in our politics. They have been instrumental in accomplishing many needed reforms along domestic and moral lines, and in creating a sentiment favorable to the strict enforcement of the law. The tenor of the whole book is very forward-looking — no pining for the Good Old Days here — and anticipates a future both rational and bright. The introduction makes it a point to reconcile, or maybe I should say to align, the two perhaps slightly contradictory impulses of the book, the action in the traditional smaller and revolutionary larger spheres, connecting women’s safely traditional mission to their newfound political one…. In these later times professors of the culinary art tell us the cooking has been reduced to a science, and that there is no more guess work about it. They have given high sounding names to the food elements, figured out perfectly balanced rations, and adjusted foods to all conditions of health, or ill health. Two distinctly satiric recipes are slipped in among the regular ones for suet pudding and stuffed tomatoes, which give the flavor of the informal side of the suffrage controversy, four years before the passage of the 19th Amendment, and five years before its ratification. Clearly valuable political lessons were being learned here. In preparation for an exhibit on sugar, I’ve been looking at a set of home candy making manuals from that 1880’s and 90’s. Cookbooks had, of course, been giving recipes for making confectionery at home for more than 100 years, when these were published, so what sets them apart? Sugar was originally known to Europe as a rare and costly spice, but the growth of sugarcane production, first in the Mediterranean and then in the Atlantic regions, made it ever more available. Between the middle of the 17th and the middle of the 19th century, sugar was transformed from a luxury to a widely consumed commodity. Grain, livestock, lumber and salt cod from America were crucial to the maintenance of the sugar colonies in the West Indies in the 18th century, and by the mid 19th Americans had access to plentiful cane sugar from the East and West Indies, plus its own cane sugar from Louisiana and beet sugar from the broad “beet belt” across the continent. As production and consumption chased each other upwards, prices fell, and by the mid 19th century it was a thoroughly common article of diet in the US. The first cookbooks in English that relied on sugar were addressed to those who cooked for great households, for instance François Massialot’s Court and Country Cook of 1702, which included a translation of his Nouvelle instruction pour les confitures from 1692. But sugar was rapidly ceasing to be the province of the wealthy, and sometime around 1760 Hannah Glasse published her Complete Confectioner OR, THE Whole Art of Confectionary Made Plain and Easy, and in 1789 Frederick Nutt (who had apprenticed with Domenico Negri, the reigning confectioner of his age) published his Complete confectioner or, The whole art of confectionary: forming a ready assistant to all genteel families, both directed at households of the middling sort. Mechanization and cheap sugar ushered in the age of penny candy, arguably the original modern consumer good aimed specifically at children. This brings us back to our 1880s and 90s home candy manuals, published at a time when candy was becoming ever more abundant and cheap, as this was also the era of pure food scandals. The four candy manuals I’ve been looking at all betray a distinct anxiety about adulterated, commercially produced candy and send the message that making candy at home keeps the family safe from the unwholesome commercial article. In an era when reformers tried to persuade parents to restrict children’s purchase and consumption of candy, warning that it would lead to adult vices like tobacco and alcohol, these books seem to seek to make candy safe by bringing it under control in the home sphere. They promote candy making as a wholesome domestic pastime, as well as a defense against adulterated food , and indeed this era saw the rise of candy-making as a genteel leisure activity. Candy Making at Home: Containing Full Directions for Making in Your Own Kitchen About Two Hundred and Fifty Different Kinds … by One Who Has Tried It published in 1884 begins by quoting in full a scare article republished from The Household of Brattleboro, Vermont, June 1879 , which gives the tenor of the conversation about pure and impure candy. at the same price per pound as the plain sugar itself. places are morally sure of getting a genuine article. used, in some qualities it forming from 50 to 60 per cent. cles consumed in this country. Certainly good reason to make candy at home, instead. We also, possibly, see a whisper of the Colonial Revival in these manuals: most contain recipes for “Old-fashioned Molasses Candy” – the only recipes in which refined sugar does not predominate. The Colonial Revival’s focus on the home, and its nostalgia for a virtuously homespun past may be manifested here as it was in architecture, art, and landscaping. In any event, the safety and innocence of the domestic sphere is vividly contrasted with the heartless hurly-burly of the marketplace. Reading the prefaces of cookbooks attunes the ear to the Authorial voice, but it is by no means only in the preface that that voice is to be found. I offer, as an example The Queen Cook Book, of 1895, by Mrs. William Hart Boyd, or to give it its full title, The Queen Cook Book: A Careful Compilation Of Recipes And Practical Information For Cooking And Other Household Requirements. The four months from the time of strawberries in June, till October, is the harvest time for fruits for every housekeeper, as well as for the industrious farmer, to go earnestly into the work of securing the winter and spring supplies of relishes, preserves, canned fruits, pickles and condiments of various kinds. To an ambitious housekeeper it is a genuine pleasure and satisfaction, that she may be fully equipped to supply the needs of those who are depending upon her for much that goes to make life a pleasure. There is no claim made for originality in the recipes, as the appellation “Compilation” in the title makes clear. The author draws liberally on Mrs. Rorer and the Home Messenger for her recipes, and also relies on, for instance “a French Chef from Heidelberg” for her recipe for French Fritters, which is Pâte à choux made into balls and deep fried. But my favorite of her sources is “Bob the Sea-Cook,” who has provided three recipes for the book. One is for bread, when made at sea (which may indeed count as two recipes, since it includes Bob’s prescription for how to handle yeast for use at sea,) another for Haricot (Harako) Soup, and a third for an omelette. But then she goes on to give directions for making this deleterious article. Bob The Sea Cook’s Omelet.